THEN: It appears that pioneer photographer Henry Peterson has recorded Joseph Raber posing with his family in their garden at the south end of Lake Union in 1882. 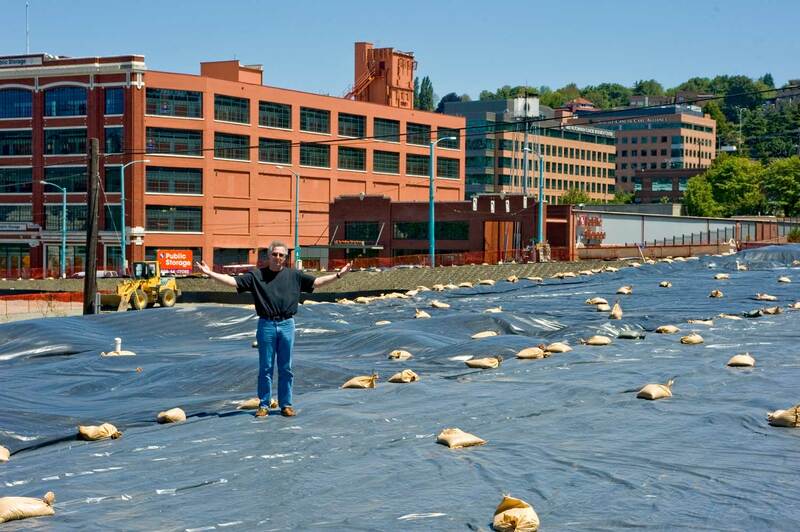 NOW: Historian Ron Edge returns to the Raber garden site, now a field of plastic at the northeast corner of Boren Avenue and Mercer Street. The changes are part of the Mercer Corridor Project, which can be studied on the Seattle Department of Transportation website at www.cityofseattle.net/transportation/ppmp_mercer.htm. In the “now” recording, Ron Edge raises his arms in surprised thanks to the highway department. All buildings from this corner of Mercer Street and Boren Avenue have been cleared. In their place Edge stands on a field of stretched plastic, an ironic repeat of the Raber family’s garden. Ron and I agree that the sandbags represent potatoes. To us, the sacks standing behind the quartet of farmers in the “then” photo resemble gunnies stuffed with potatoes. The historian-collector Edge purchased this farm scene out of admiration for the work of its photographer, the studio of Peterson and Bros. For about a decade after their 1876 arrival in Seattle, Henry and Louis Peterson’s recordings of our city are on the whole the best. This portrait of the Raber farm — now near the Mercer Street exit off Interstate 5 — is rare for its subject and how remote it is from the Peterson studio at the western waterfront foot of Cherry Street. The photographers may well have been friends with the Rabers and even traded this recording for produce. Bartering was then commonplace – and may become so again. “Joseph Raber farm near Lake Union 1882” is written on the back of the original print. Next to the print’s own caption, the leaning tree on the south shore of Lake Union was very helpful in locating both the place and point of view, which is looking northeast. The tree shows up in several other photographs of the neighborhood (see below). Those clues, joined with property records from the state archives and city directories, made it possible for Jean Sherrard and Ron Edge to return to the garden of sandbags and stand within a few feet of where Raber and the others posed with their crops. 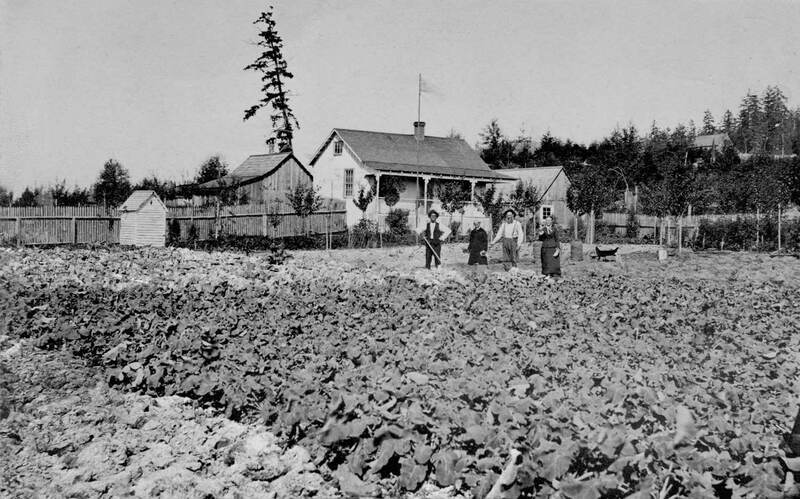 We may have a mere glimpse of part of the Raber farm house in the panorama of the south end of the Lake Union that looks south sometime in the mid-late-1880s from near Boren and John – a bit northwest of Boren and John probably. 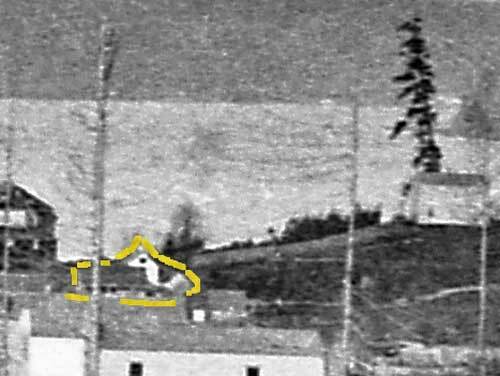 Note that the leaning fir tree – our clue from Ron Edge’s Peterson pix of the Raber farm – appears in the pan. In the detail below the pan I have outlined in yellow what I think-believe-trust-hope is the Raber home, or the parts of it that show above and around another structure that sits between it and the photographer. Otherwise other recordings of the Raber farmhouse – or parts of it – have so far escaped us. Click to Enlarge this one – surely. Another pan looking north to Lake Union from a prospect near Fairview and Thomas. The leaning lone fir is again helpfully apparent against the lake. 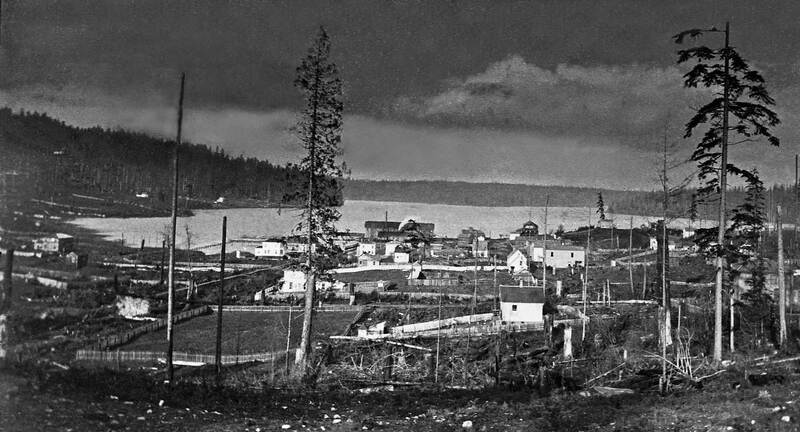 The mill’s position is obvious, left of center, and Queen Anne Hill is on the distant left. This also dates from the mid-late 1880s. The Raber farmhouse, if it survived, is hidden behind the frame house that holds the mid-ground, right-of-center. This look east across the southern end of Lake Union is a puzzle, although surely one that can be unraveled with time. This is a very early view of the Western Mill – it is still quite primitive – and yet there is no Raber farm to be found here. It seems most likely that the farm and the lone fir are just out of frame to the left, although this still troubles me. I expected the farmhouse to be apparent on the left side of this view by the pioneer photographer Peiser. The date is mid-1880s. The next panorama from Queen Anne Hill – like this one – has considerable text following it, and is one of three features that now follow, which were originally in the only surviving big pulp in town – the Times. 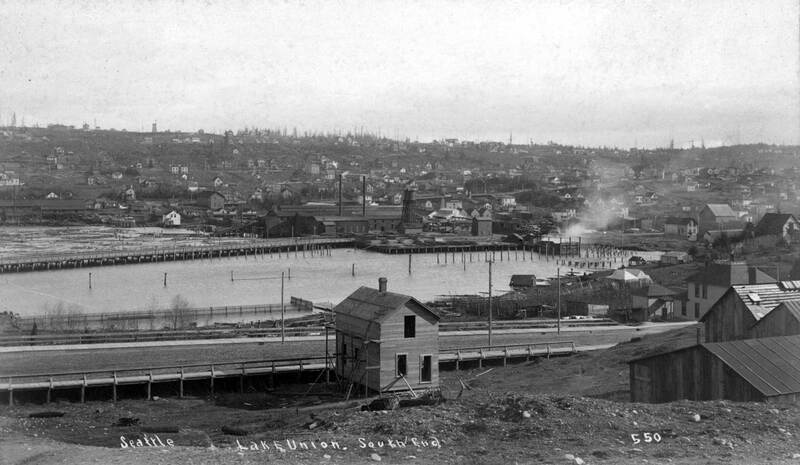 In the interests of promoting the south end of Lake Union as the strategic route for boomtown Seattle’s rapid spread north, an early 20th-Century real estate company called it “The Big Funnel.” In 1906 Westlake Avenue was cut through the city grid thereby linking the business district directly with the lake. Here the way for the funnel is still being prepared by the Western Mill built, in part, over the lake and seen at the center of Arthur Churchill Warner’s ca. 1892 photograph. 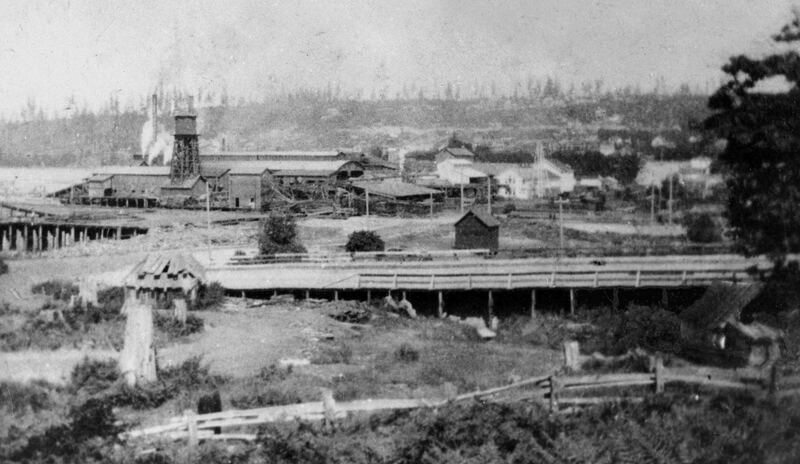 When Western Mill was first built in 1882 it was surrounded by tall stands of virgin Douglas fir and cedar. The mill worked around the clock to turn it all into timber and here only a decade later the neighborhood is practically void of trees. A few stragglers survive on the Capitol Hill horizon. Most likely many of the homes that dapple this landscape were conveniently built of lumber cut from the trees that once stood here. The street in the foreground is Dexter. Beyond it is the trolley trestle bound for Fremont that was built over the lake north from the mill in 1890. Its name, Rollins, was changed to Westlake not long after Warner photographed it. This side of Westlake — the Lake’s extreme southwest corner — was a popular summer swimming hole until it was turned into one of the city’s many dumps and filled in with garbage and construction waste in the late teens. Once landlocked, Westlake was soon widened and paved. Beyond the Westlake trestle is a millpond littered with logs. There more recently a distinguished line of vessels has been moored. These include ships stationed here after the Naval Armory was completed in 1941. There the ferry San Mateo rested here until she was towed to Canada. (When this text was first composed in 1997 the San Mateo’s younger sister ferry the Kalakala was expected to find refuge in this harbor. She was moored instead on the north shore of the lake. Now the last of our “Mosquito Fleet” steamers, the restored Virginia V, bobs in these waters as one of the main attractions of the new Marine Center that is rejuvenating the old armory that will soon become the new home for the Museum of History and Industry (MOHAI). 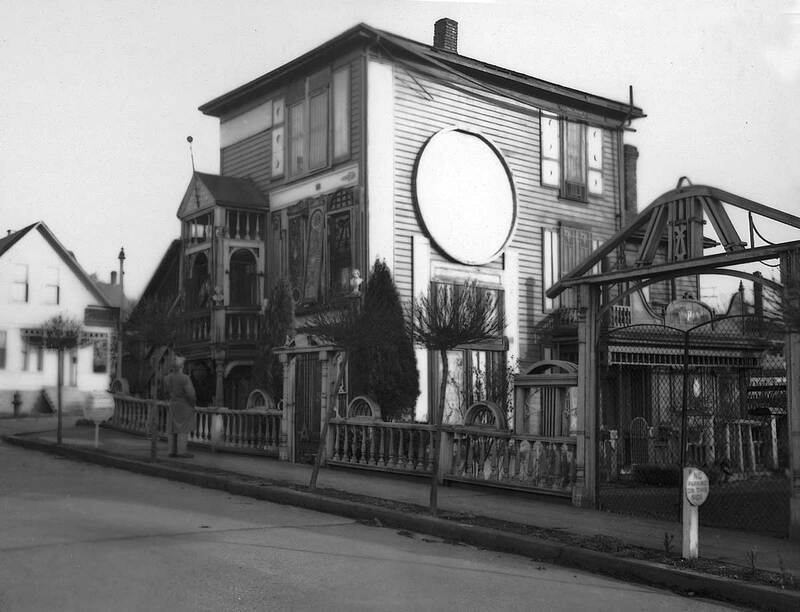 Locals with a taste for irony may recall that another Puget Sound steamer, the City of Everett, gave her last days here as the converted Surfside 9 Restaurant. 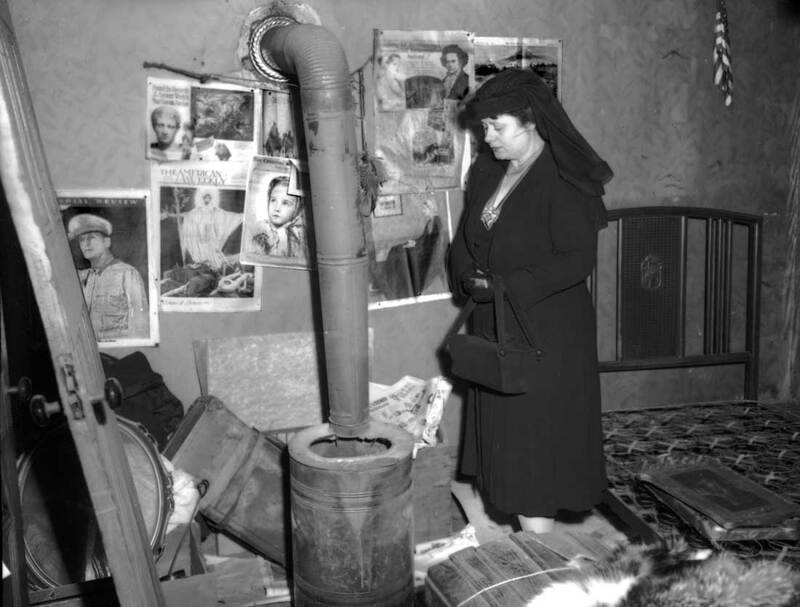 She sank in the 60s after City Light turned off her bilge pumps for failure to pay the electric bill. 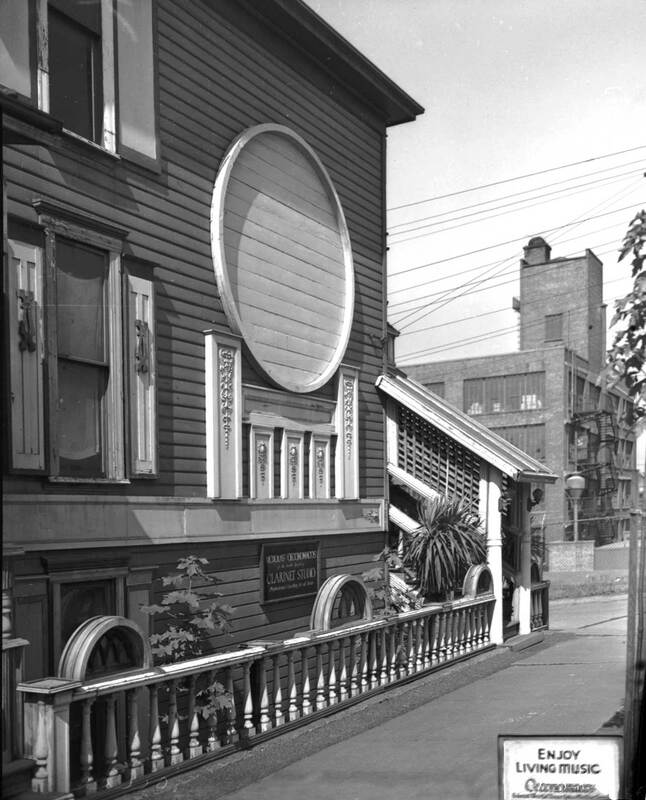 This raw little photograph (above) is probably what it is often described as being: a record of the day when the Seattle Coal and Transportation Company gave locals free rides on its new railway between Lake Union and the ridge above Elliott Bay – where the Pike Place Market now holds. Immediately left of center stands a woman in a cape and flamboyantly banded dress. She may be holding an inaugural flag in her left hand – the bright triangular form. Another flag stands to the right of center and against the sky. The familiar stack of the little locomotive Ant rises above a somewhat scattered crowd in which every head appears to be posing for the photographer, whose camera looks north in approximate line with present-day Westlake Avenue toward Lake Union. (The scene may actually be closer to mid-block between Westlake and Terry.) The distant ridge still dark with old-growth forest is the future Wallingford. The Ant arrived from San Francisco on Nov. 21, 1871. It took 16 horses to drag it from the waterfront up to Pike Street, where it was set to work building a narrow-gauge track along Pike and down the future Westlake (or near it) to the lake. There, eight locally made coal cars were routinely transferred form barges and hooked to the Ant. On March 22, 1872, every citizen was given a free ride; benches were installed for the occasion in the system’s first eight gondolas. Accompanied by a brass band – for at least the first trip – the train ran back and forth from sunrise to sunset. The entire route was 17-plus miles long. It started in the coalmines on the east side of Lake Washington – those around Coal Creek and Newcastle – on another narrow gauge railroad. The cars were transferred to barges on Lake Washington and then towed by a small steamer to the Montlake portage. There they were pulled along another railroad track by cattle driven by members of the Brownsfield family that first settled the University District. The cars were next transferred to barges again for another steam through the length of Portage Bay and Lake Union to transfer at the place shown here for another haul by rail to the over-sized Pike Street Wharf and coal bunkers. It was an expensive and complex haul in all, but still it paid well, making coal Seattle’s biggest export during the late 1870s. The last coals from Newcastle traveled this route on Jan. 29, 1878. 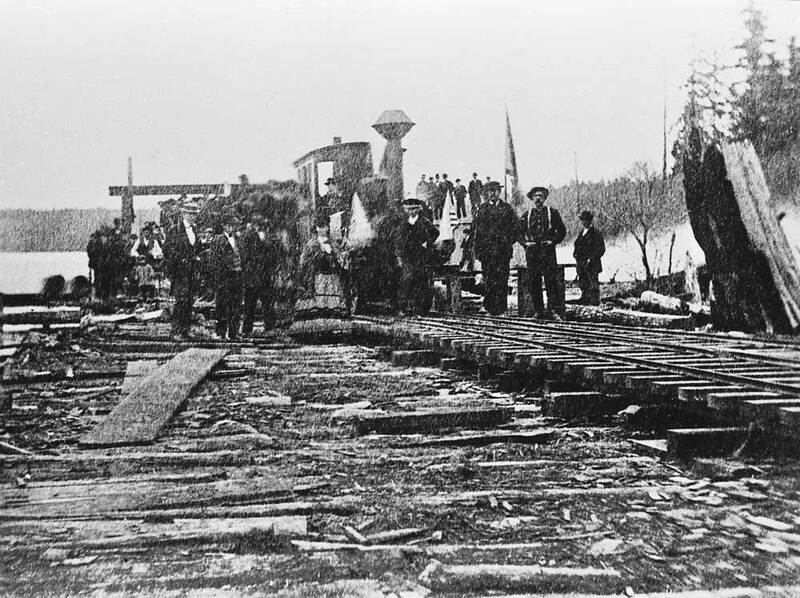 By then the Ant had been transferred to the new Seattle and Walla Walla line, which ran directly around the south end of Lake Washington from the company’s new coal wharf off King Street to its Eastside coal fields. 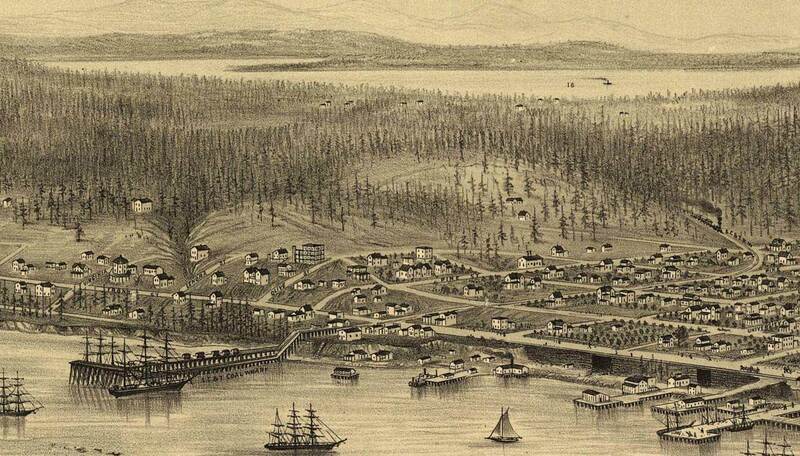 In the detail from the 1878 birdseye of Seattle, there is no Lake Union to be seen. The coal railroad however is there chugging out of the forest, far right, and heading to the Pike Street Coal Wharf, far left. Lake Washington is in the distance with a lone steamer heading for a stage connection with Seattle by way of a wagon road on or near Madison. The splendidly eccentric square-jawed figure of Nicholas Oeconomacos holding his cane, kid gloves and wide-rimmed fedora posed for Arthur “Link” Lingenbrink sometime in the 1920s. 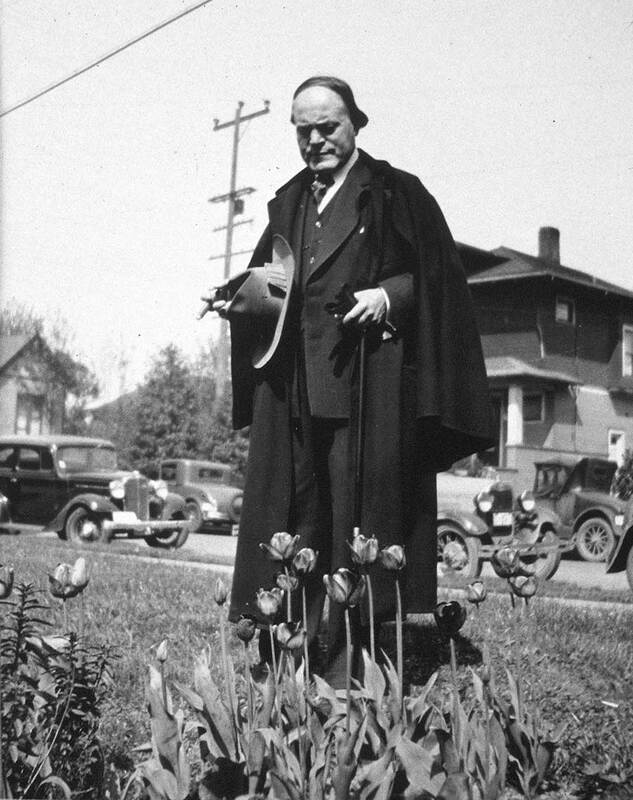 Oeconomacos in his black cape stands above the spring tulips in his front yard at the southeast corner of John St. and Boren Ave. Link had his own specialties, including storytelling, celebrity chasing and sign painting. To those who merely saw him with his oversize flat black hat shading his big head, a studded cane, a black cape and the practice of carrying his caged canary on walks downtown, the Greek clarinetist was a valued eccentric. Those who also heard him enjoyed what Homer Hadley, who conducted the Seattle Symphony when Oeconomacos first joined it as principal clarinetist about 1910, described as “the softest clarinet in the world.” John Philip Sousa claimed to Seattle art patron Henry Broderick that Oeconomacos was the best clarinet player ever to appear in his band. 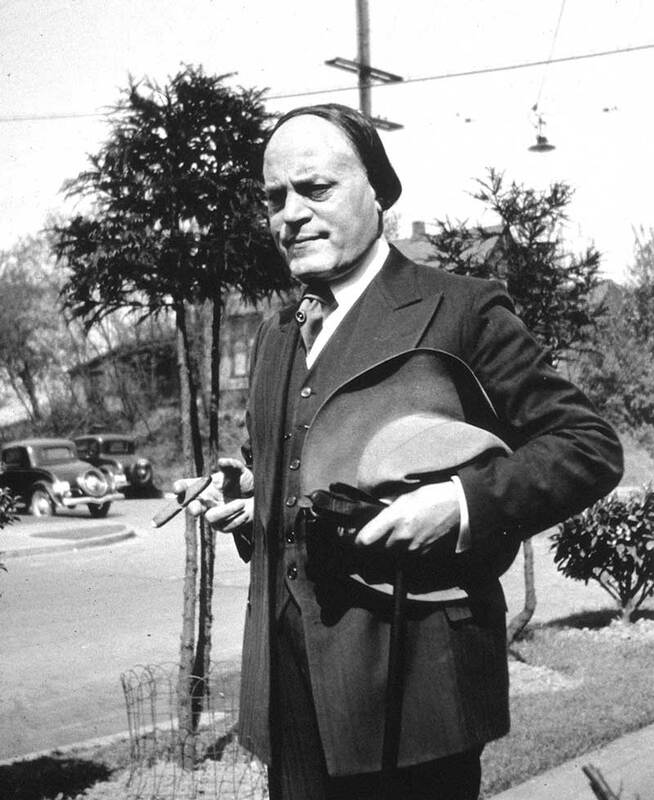 Oeconomacos made two world tours with Sousa before settling in Seattle. (Note the tower atop the Ford Assembly plant, which is still in place but for other uses – perhaps storage units. It was for much of its life home for Craftsman Press.) Oeconomacos called his new home the House of the Terrestrial Globe. (Hence the simple circle ornament top center and another one on the west façade – see below.) The little sidewalk sign at the bottom right-hand corner that reads “Enjoy Living Music” is surely Arthur Lingenbrink’s. I became very familiar with Link in the early 1980s when he was in his early 90s. With his brother Paul he was a professional sign painter and a very good storyteller – including stories about his friend Oeconomacos. I recognize his style. I purchased this oil of the Garden of Memories from the estate of Ron Philips, another virtuoso clarinetist and principal player with the Seattle Symphony. As a young Seattle player Ron knew Nicholas, although he may have called him Mr. Oeconomacos. 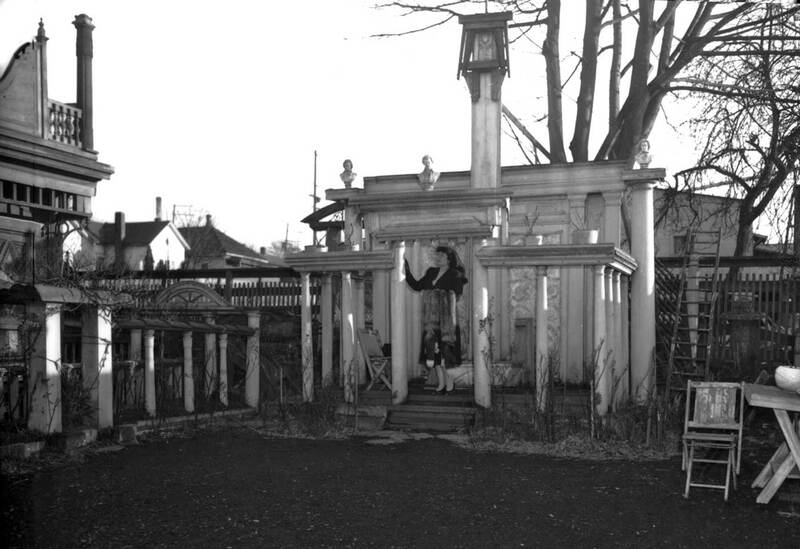 On the far west side of his home, the virtuoso appointed his Garden of Memories with fluted columns and other classical ornaments that reminded him and his audience that he first practiced in the shadow of the Parthenon. He managed to scrounge the pieces for his sets and applications from thrift and junk stores and the back lots of second-hand building suppliers. 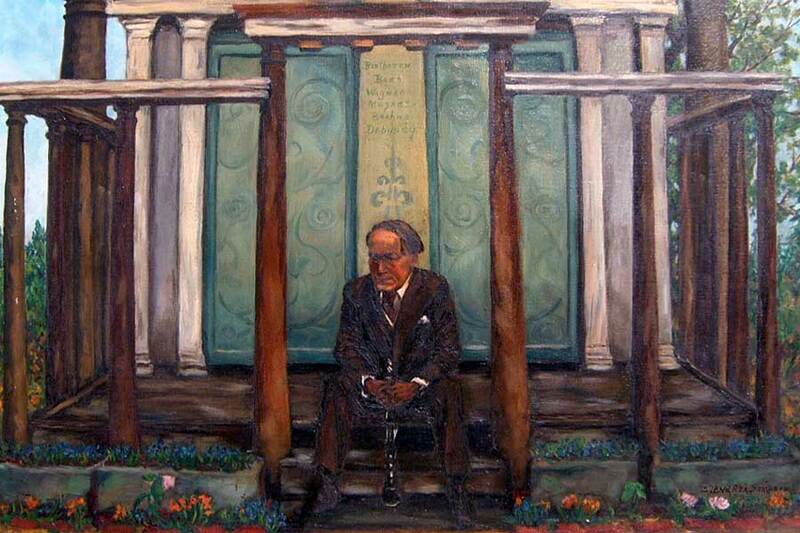 It was there, seated in his Greek garden, that Oeconomacos played his last solo concerts of “living music” as the sign reads. The clarinetist was not fond of radio. The clarinetist's niece posing inside uncle's home for a Post-Intelligencer photographer. Courtesy Museum of History and Industry, as are the other House of the Terrestrial Orb images included here. Finally - and out-of-focus - this look to Western Mill from the west includes a Native American home made largely of cedar slabs. Can you find it? Capitol Hill is on the horizon. Courtesy, University of Washington, Northwest Collection.